It’s only been one year since the cowardly teens bombed the Boston Marathon. I remember my horror watching the news unfold. I lived in Boston three years ago and worked right off Boylston street. That street was my old stomping ground. I watched the hunt. I felt the fears of those who lived in that area. I was so proud to see all the victory stories. Those great service men who brought milk to the families with kids. For all of the pain I felt, I felt pride in the people who made it better. I ended up going back to Boston a week after the attack. I saw the closed streets. I saw a man in a suit stand on the curb with tears running down his face. I had a very heavy heart for the people of Boston. Yet, I felt the spirit of the people I had met when I was there. I am not one to dwell on the bad things that happen in life. I believe you need to learn from the experience. I also feel that there is inner strength to be discovered in difficult times. When I got off the airport I saw all the buses with the message Boston Strong across the banner. A stranger on the T asked me where I was the week before. I told him I was in Chicago getting ready to go coach a Girls on the Run meeting. I told him how challenging it was to explain such a thing to my daughter. He said he was lucky he didn’t know anyone injured , but it took him hours to get home out of the city. I was still in shock. How did this happen to a place I considered home? The outrage of my old stomping grounds being defiled. But yet, I was blessed enough to be on my way for a job interview in the city I had come to consider home. When I lived in Boston I lived right on the marathon route between the 23rd and the 24th mile. The first year, I walked down to Beacon street to watch the Runners, I was unsure and it was a new environment. I had a 4 yr old in tow. I met my neighbor who lived above me. He was a russian emigre who had watched this race from the same spot for the past 28 years. He was so proud to be so close to this great American tradition. He and I and my daughter stood together with the hundreds of other folks and watched the wheelchairs, then the runners. I didn’t comprehend what 26+ miles really entailed. The commitment to training your body and your mind. I watched from the same spot over the next couple of years. I had the opportunity to see the situation from anothers perspective. This time I had a born and bred texan with me. I learned to set up chairs. Had a morning cocktail with the rest of the crowd. I think we had hot grilled cheese and gin and tonics. ( The texans idea of Miller lite did not seem to fit. ) Imagine a polite not too raucous tailgate party, that was the mood for the crowd at our mile marker spot. I was so proud to show this part of Boston to a Texan. I loved my corner. I loved the people. I could never imagine that something catastrophic could happen 3 miles down. A mom in Em’s old class had the most amazing story about her husband and her child missing the bombing by a few minutes. How does all of this apply to Black and Blue? Black and Blue is one of my favorite beers. After the bombing I felt Black and Blue. I couldn’t wrap my head around how it all could have happened. When I went back the week after, my favorite bar was still closed from the blast. The Pour House on Boylston was and is my favorite bar. I would have one on one’s with my staff there. We would walk across the street from our store. I would buy a round for us and a side of chicken wings. The thai peanut were my favorite. The Pour House is a very colorful place. The dwellers there are either in business casual preppies or tattooed and pierced leather wearing folk. Loud music and a roll of paper towels on the table kind of place. I learned so much from every person I met there. For many of them it was their first Black and Blue. 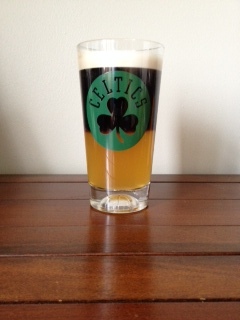 I raise my glass to them and to the citizens of Boston. The horrors of last year have left many Black and Blue , but the bruises and hurt will fade. Pour Blue moon into glass. A quick pour. You want a little bit of a head on this part of the beer. Take a spoon turn so rounded side it up pour Guinness slowly on top of spoon and over beer. A nice layer will occur. Need help finding a past drink?